Yahweh and Yahshua should be one of our main goals, if not THE main one; even Yahshua had this in mind for us, John 17. We are to be Heavenly Minded, where Yahweh and Yahshua are. Since, then, you have been raised with Messiah and are to set your hearts on things above, where Messiah is, seated at the right hand of Yahweh. Set your minds on things above, not on earthly things, Colossians 3:1–2 NIV. We are to have priorities to be successful. Getting our life in line with Yahweh and Yahshua must be a priority. The things we desire are of the heart, and the things we think about are of the mind. We are to have both of these set on Yahweh and His ways which are spiritual and are eternal. Trust in Yahweh with all your heart, and lean not on your own understanding; in all your ways a knowledge Him, and He shall direct your paths. Do not be wise in your own eyes; fear Yahweh and depart from evil, Proverbs 3:5–7 NKJV. This was Solomon's wisdom, but where did it come from? From heaven, of course. In Messiah, we have Wisdom from heaven we can tap into. We are to apply our lives in accordance with the Word of Yahweh, which Yahshua did, and not worry so much about physical things. But seek first His kingdom and His righteousness, and all these things will be added to you. So do not worry about tomorrow; for tomorrow will care for itself. Each day has enough trouble of its own, Matthew 6:33–34 NASB. Yahshua had the full understanding that physical life is temporary and has troubles in it, but He also understood that the things we need will be provided to us, so we don't need to worry. It may take time, but, if we have our priorities set up on Yahweh and His ways, then Yahweh Himself will take care of us as a Father cares for His children. He is our Comforter. This is sometimes hard for us to comprehend, because we may have not been raised by a caring father. Maybe our own dad didn't do the things he should have done. What we have to understand is that Yahweh is our spiritual Father and that He does care about us and has mercifully called us to have a better future than what our past may have been like. This calling, however, is not without effort on our part. 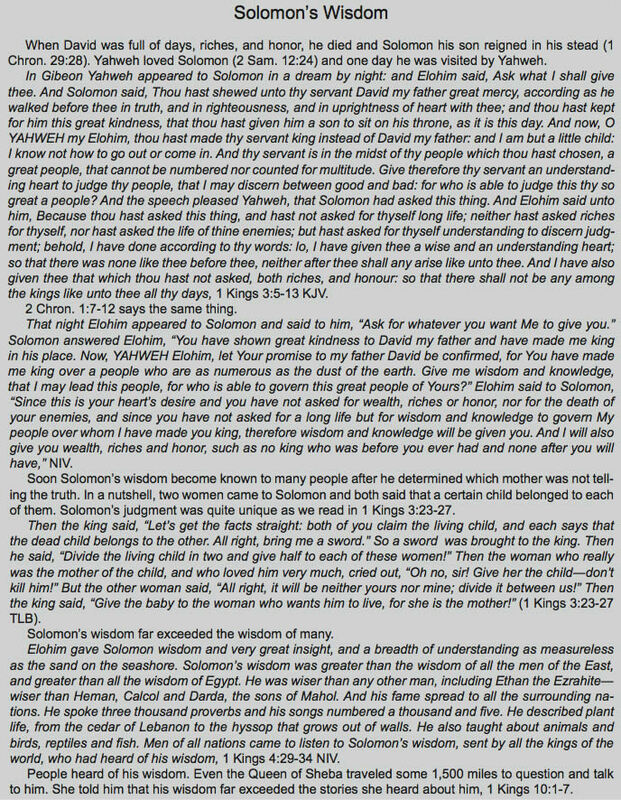 Solomon said, "My son, if you accept my words and store up my commands within you, turning your ear to wisdom and applying your heart to understanding—indeed, if you call out for insight and cry aloud for understanding, and if you look for it as for silver and search for it as for hidden treasure, then you will understand the fear of Yahweh and find the knowledge of Elohim,” Proverbs 2:1–5 NIV. Again we find ourselves back in Proverbs, with Wisdom speaking. If one wants true Wisdom, one only needs to ask. But we can also read Proverbs and spend more time in the Bible overall. The conclusion, when all has been heard, is: fear Yahweh and keep His commandments, because this applies to every person. Why does it apply to every person? It does because everyone will be judged for the good or bad that they did. Not just for Israel and not just for brethren today who are actually going through a type of judgment process now, but for everyone. The Apostle Paul's words seemed like an illogical paradox at times, but the depth of what he said is important for us to understand. But this I confess unto thee, that after the way which they call heresy, so worship I the Elohim of my fathers, believing all things which are written in the law and in the prophets ... And herein do I exercise myself, to have always a conscience void of offence toward Yahweh, and toward men, Acts 24:14, 16. Concerning zeal, persecuting the assembly; touching the righteousness which is in the law, blameless, Phlp. 3:6. Not once did Paul say not to keep the commandments. He expressly confirmed them in speech (“Circumcision is nothing, and un-circumcision is nothing, but the keeping of the commandments of Yahweh,” 1 Cor. 7:19.) and in action (“While he answered for himself, neither against the law of the Jews, neither against the temple, nor yet against Caesar, have I offended any thing at all,” Acts 25:8.). The struggle expressed by Paul in a frank admission that he didn't always do what was right (Rom. 7:15-21), puzzles some today. Even Paul didn't seem to understand what was going on (verse 15) at the time. If he was indeed blameless and couldn't rightfully be accused of breaking the law, then what was he talking about? When speaking of the flesh, we can speak of the effect that the pulls have on us, some of which are not so easily identifiable to others. The ones fairly obvious to others would be stealing, openly lying and cheating, murder, adultery, and the list goes on. Another not so obvious fleshly attribute would be the internal struggle with our attitude. For example, we can become angry about a situation and not fully be submitting to Yahweh's Spirit, only to repent afterwards for not having been fully in control as we would have liked to have been. There are situations which arose for Paul that tested his attitude and there will be situations that will test ours. While we are to emulate the Fruits of the Spirit, having actions and an attitude as Yahshua did (Phil. 2:2-5), our flesh sometimes gets in the way. To counter trying to be heavenly minded, Paul expressed his fleshly side when dealing with a situation that involved a couple of brothers. Mark, whom the book of Mark is attributed to, evidently had departed Paul's company earlier (Acts 13:13) and went to Jerusalem instead. In talking with Barnabas, who wanted Mark to come with them later, Paul became very irritated with the situation and had a "sharp disagreement" (NIV) which is related in the New Jerusalem Bible as a "violent quarrel" (Acts 15:39). We are told immediately afterwards that Barnabas took Mark and sailed for Cyprus. Did Paul regret and even repent of that altercation and his own attitude? This is evident, as later we see him having not harbored ill feelings towards either Mark or Barnabas (1 Cor. 9:6; 2 Tim. 4:11). Don’t be misled — you cannot mock the justice of Elohim. You will always harvest what you plant. Those who live only to satisfy their own sinful nature will harvest decay and death from that sinful nature. But those who live to please the Spirit will harvest everlasting life from the Spirit. So let’s not get tired of doing what is good. At just the right time we will reap a harvest of blessing if we don’t give up, Galatians 6:7–9 NLT. It's a principle of the sinful flesh vs. obedience to the Spirit. Learn to live according to Yahweh's will in the Spirit by not committing the sins of the flesh, such as stealing, lying, cheating, and the like. These are all which commandments are against doing. There's nothing wrong with building a house or even starting a business; those are physical things in which there are no laws against, unless we consider building codes or other civil licensing statutes. And, unless one wants to start working and making purchases or selling on the Sabbath to provide for those things, then one is satisfying their flesh and rejecting the Spirit of Yahweh and His Truth. One of the first teachings of the Messiah, based upon Yahweh's Word, was not only to repent, but also to not focus on material riches. Do not lay up for yourselves treasures on earth, where moth and rust destroy and where thieves break in and steal, but lay up for yourselves treasures in heaven, where neither moth nor rust destroys and where thieves do not break in and steal. For where your treasure is, there your heart shall be also, Matthew 6:19–21 NASB. He's basically saying to focus on the spiritual and to desire those riches which are from above. Put your energies and wealth toward the heavenly things, investing in those things which are eternal. Does this mean we should neglect our family or other responsibilities? No. But, we are to have a balance, and have our priorities straight. We are to love Yahweh and Yahshua more than anything else, including our own lives. For you have died and your life is hidden with Messiah in Yahweh. When Messiah, Who is our life, is revealed, then you also will be revealed with Him in glory. Therefore consider the members of your earthly body as dead to immorality, impurity, passion, evil desire, and greed, which amounts to idolatry, Colossians 3:3–5 NASB. The wording here is death. In other words, we have died to these things. We are to be dead to the old way of living, which is contrary to Yahweh's way and life. We are not to resurrect those things, but when we are resurrected we will be with the One Who has saved us from such a sinful life. There is therefore now no condemnation for those who are in Messiah Yahshua. For the law of the Spirit of life has set you free in Messiah Yahshua from the law of sin and death. For Elohim has done what the law, weakened by the flesh, could not do. By sending His own Son in the likeness of sinful flesh and for sin, He condemned sin in the flesh, Romans 8:1-3 ESV. A couple of things should be pointed out here. First, we are forgiven of our sins by Messiah's sacrifice for us. His blood covers and purifies us. And second, we are granted the Spirit to indwell in us so we can meet the requirements of the law. What are the requirements of the law? Obedience, of course. And, with that said, we acknowledge we are under the Melchizedek Order. Read our free in-depth booklet called, "Orthodox Believers." By sending His own Son in the likeness of sinful flesh and for sin, He condemned sin in the flesh, in order that the righteous requirement of the law might be fulfilled in us, who walk not according to the flesh but according to the Spirit. For those who live according to the flesh set their minds on the things of the flesh, but those who live according to the Spirit set their minds on the things of the Spirit, Rom. 8:3-6 ESV. How important is it for us to be Spiritually minded, to be Heavenly Minded? It's a matter of life and death. And if you call on the Father, Who without partiality judges according to each one’s work, pass the time of your sojourning in fear, knowing that you were redeemed from your futile way of life inherited from your fathers, not with what is corruptible, silver or gold, but with the precious blood of Messiah, as of a lamb unblemished and spotless, 1 Peter 1:17-19 TS. The greatest blood sacrifice ever given, Yahshua, the precious Son of Yahweh, was given as a lamb to the slaughter. He took our death penalty away, and kept it away, if we walk in the Spirit of Yahweh and don't fight against it by submitting to our flesh and our old way of liv- ing life...the way we used to live life, that is, in the flesh, in sin. For the mind set on the flesh is death, but the mind set on the Spirit is life and peace, because the mind set on the flesh is hostile toward Elohim; for it does not subject itself to the Law of Yahweh, for it is not even able to do so, and those who are in the flesh cannot please Elohim. However, you are not in the flesh but in the Spirit, if indeed the Spirit of Yahweh dwells in you. But if anyone does not have the Spirit of Messiah, he does not belong to Him. Just proclaiming the law and having faith in the Messiah is not enough. It's not enough because we're told to walk in the very Spirit of Yahweh and Yahshua. We are to have that intimate connection and walk with Them. 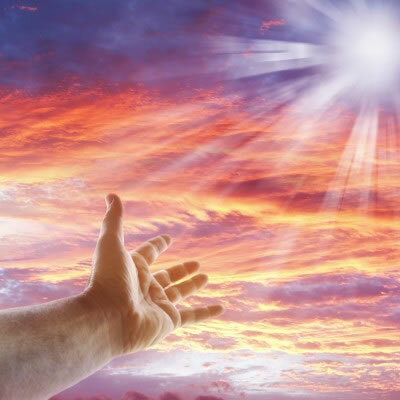 It is being Heavenly Minded, when Yahweh's Spirit is recognized and submitted to. The natural person does not accept the things of the Spirit of Yahweh, for they are folly to him, and he is not able to understand them because they are spiritually discerned. The spiritual person judges all things, but is himself to be judged by no one. For who has understood the mind of Yahweh so as to instruct Him? But we have the mind of Messiah, 1 Corinthians 2:14–16 ESV. Paul is saying that even though Yahweh is high above all, we can understand the very mind of Yahweh by having the mind of Messiah in us. As Yahshua submitted to Yahweh's will, we are to do so also with the spiritual down payment of the Spirit we have received and with Messiah working with us. Coming to Him as to a living stone, rejected indeed by men, but chosen by Elohim and precious, you also, as living stones, are being built up a spiritual house, a holy priesthood, to offer up spiritual sacrifices acceptable to Yahweh through Yahshua Messiah, 1 Peter 2:4–6 NKJV. We, each individually, are being built up. The point being, for us, we are in process. There is shaping and chiseling and moving, so that we may fit properly. The process continues as we are worked with by the Spirit and by Messiah within us. In fact, we may not even perceive the Spirit until after we are matured and have been converted enough into the body of Messiah for a time. The Apostle Paul was converted and matured. The Spirit was indeed perceived by him, but not only him. By Peter and John and others, also. It is granted that these were anointed men who were no doubt granted extra help to preach the Word accurately and effectively. Truly, they were Heavenly Minded. Even today, we are being built up spiritually to offer spiritual offerings to Yahweh through Yahshua. We are to be one with Them by submitting and learning from Them. But the hour is coming, and now is, when the true worshipers will worship the Father in Spirit and Truth; for the Father is seeking such to worship Him. Yahweh is Spirit, and those who worship Him must worship in Spirit and Truth, John 4:23–24 NKJV. Trust in Yahweh with all your heart, and lean not on your own understanding; in all your ways acknowledge Him, and He shall direct your paths. Do not be wise in your own eyes; fear Yahweh and depart from evil, Proverbs 3:5–7 NKJV (see also Deut. 10:12, 16; 11:1). Walking on higher ground is being Heavenly Minded. It's a wonderful and awesome thing. Yet, if we lean on our own ways and do what is right in our own sight, running after evil and doing evil...what then? Because of these things the wrath of Yahweh is coming upon the sons of disobedience, in which you yourselves once walked when you lived in them. But now you yourselves are to put off all these: anger, wrath, malice, blasphemy, filthy language out of your mouth, Colossians 3:6–8 NASB. The listing just before this, in Colossians 3:5, was fornication, uncleanness, passion, evil desire, and covetousness, all of which Paul likened to idolatry. Evidently, he wanted to make the point that such things were indeed an abomination in Yahweh's sight. Do not lie to one another, since you have put off the old man with his deeds, and have put on the new man who is renewed in knowledge according to the image of Him Who created him, where there is neither Greek nor Jew, circumcised nor uncircumcised, barbarian, Scythian, slave nor free, but Messiah is all and in all, Colossians 3:9–11 NKJV. There are a wide variety of members in the body; all are accepted as equal in Messiah. We are also to have one thing in common; we are all to be Heavenly Minded.